Je suis Charlie. 8,000 people marched in Menton yesterday. 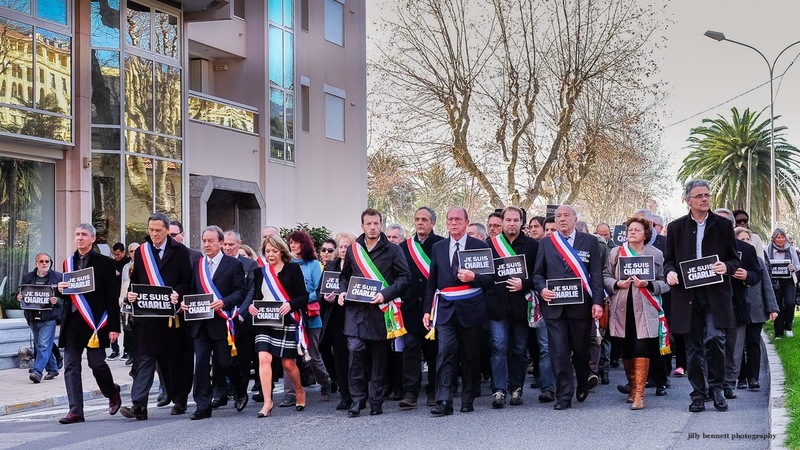 Here the Mayor of Menton leads the march along with the Mayors of nearby French communes and also Mayors from across the Italian border. Dimanche, 8000 personnes ont défilé à Menton. Voici le maire de Menton en tête de la marche avec les maires des communes voisines ainsi que ceux venant de l'autre côté de la frontière italienne. The numbers of people coming together in unity and sympathy is so moving. Beautiful to see these leaders together. Quite poignant, and good to see. This is quite remarkable. There was a small rally here - I didn't hear about it until today or I would have gone there to shoot. I saw the cover of the new issue. I understand but I question whether it is wise. I don't know if there's been any marching in Pasadena or Los Angeles. I haven't found anything online.